How do I use the Teacher app on my iOS device? As an instructor, you can use the Canvas Teacher app to access and manage course content while you are away from a computer browser. The app displays your profile, To Do list, Conversations Inbox, and functionality to access your courses. Not all Canvas features are supported on the app at this time. 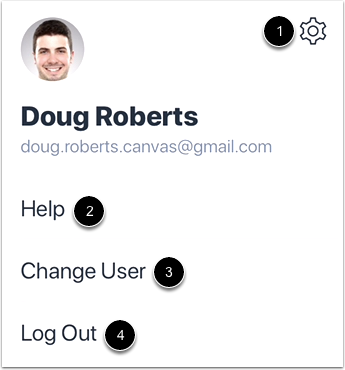 The Canvas Teacher app uses your device's settings to set the time zone used within the app. When you log in to the Teacher app, the default landing page is the Courses page, or Dashboard. 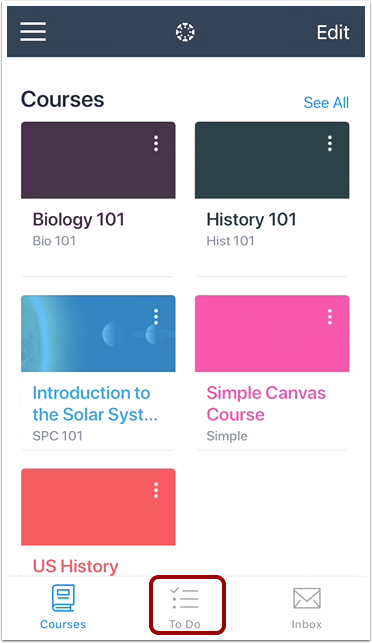 The Courses icon displays all your current courses, including your favorite courses. Learn how to view courses. The To Do icon displays all ungraded submissions in your courses. Learn how to view the To Do List. The Inbox icon displays all Conversations messages in the Teacher app. Learn how to view the Inbox. The Menu icon opens the Teacher app Profile Menu. The Profile Menu shows you all the information associated with your Canvas account. Previous Topic:How do I log in to the Teacher app on my iOS device? Next Topic:How do I view my User Files in the Teacher app on my iOS device? Table of Contents > Navigation > How do I use the Teacher app on my iOS device? Re: How can I list assignments by due date?